Are You Looking to Become Joint Commission Accredited? Are You Looking to Become Joint Commission Accredited? 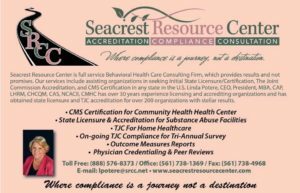 Seacrest Resource Center, Inc. is your one stop shop for all your accreditation and licensing needs. Call (888) 576-8373 today to schedule your free consultation to see what your facility needs to attain Joint Commission Accreditation or to prepare for your facilities Triennial. Here are some Benefits of Joint Commission Accreditation. Helps organize and strengthen patient safety efforts – Patient safety and quality of care issues are at the forefront of Joint Commission standards and initiatives. Strengthens community confidence in the quality and safety of care, treatment and services – Achieving accreditation makes a strong statement to the community about an organization’s efforts to provide the highest quality services. Provides a competitive edge in the marketplace – Accreditation may provide a marketing advantage in a competitive health care environment and improve the ability to secure new business. Improves risk management and risk reduction – Joint Commission standards focus on state-of-the-art performance improvement strategies that help health care organizations continuously improve the safety and quality of care, which can reduce the risk of error or low quality care. May reduce liability insurance costs – By enhancing risk management efforts, accreditation may improve access to and reduce the cost of liability insurance coverage. Provides education to improve business operations – Joint Commission Resources, the Joint Commission’s not-for-profit affiliate, provides continuing support and education services to accredited organizations in a variety of settings. Provides professional advice and counsel, enhancing staff education – Joint Commission surveyors are experienced health care professionals trained to provide expert advice and education services during the on-site survey. Provides a customized, intensive review – Joint Commission surveyors come from a variety of health care industries and are assigned to organizations that match their background. The standards also are specific to each accreditation program so each survey is relevant to your industry. Enhances staff recruitment and development – Joint Commission accreditation can attract qualified personnel, who prefer to serve in an accredited organization. Accredited organizations also provide additional opportunities for staff to develop their skills and knowledge. Provides deeming authority for Medicare certification – Some accredited health care organizations qualify for Medicare and Medicaid certification without undergoing a separate government quality inspection, which eases the burdens of duplicative federal and state regulatory agency surveys. Recognized by insurers and other third parties – In some markets, accreditation is becoming a prerequisite to eligibility for insurance reimbursement and for participation in managed care plans or contract bidding. Provides a framework for organizational structure and management – Accreditation involves preparing for a survey and maintaining a high level of quality and compliance with the latest standards. Joint Commission accreditation provides guidance to an organization’s quality improvement efforts. May fulfill regulatory requirements in select states – Laws may require certain health care providers to acquire accreditation for their organization. Those organizations already accredited by The Joint Commission may be compliant and need not undergo any additional surveys or inspections. Healthcare, allows accredited organizations to measure their organization’s performance and helps them find customized solutions for challenging health care problems. Aligns health care organizations with one of the most respected names in health care – Being accredited by The Joint Commission helps organizations position for the future of integrated care.